To make the pastry, place the flour, salt, butter and cheddar in the bowl of a food processor and process until the mixture resembles fine breadcrumbs. Add the egg and process until the pastry comes together. Wrap the dough in plastic wrap and refrigerate for 1 hour or until firm. Preheat oven to 180°C (350°F). Grate the pastry into a 28cm round tart tin and press into the base and sides of the tin. Prick the base with a fork and cook for 20–22 minutes or until golden brown and cooked through. Allow to cool completely. Place the tomato, vinegar, oil, salt and pepper in a large bowl and mix to combine. Place the ricotta, buttermilk, lemon rind, salt and pepper in a separate bowl and mix to combine. 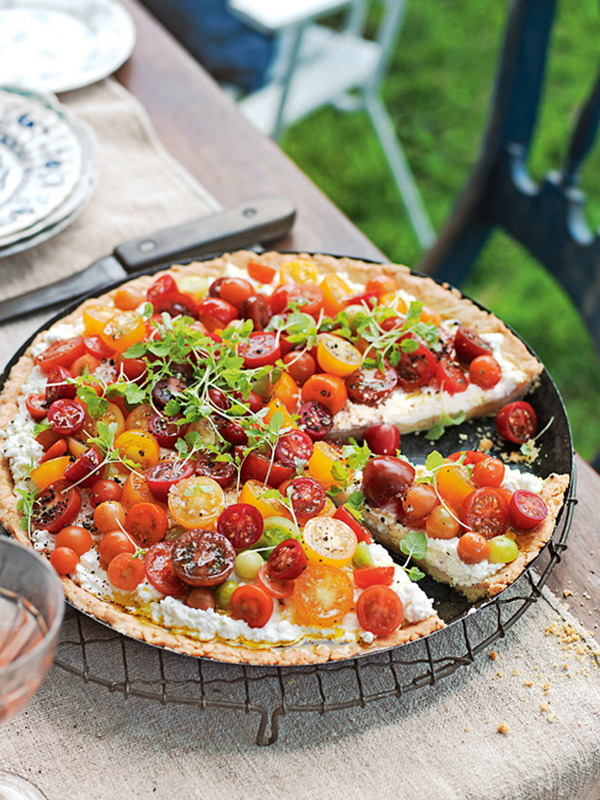 Spread the tart base with the ricotta mixture and top with the tomato mixture. To serve, sprinkle with lemon balm, salt and pepper. Serves 10.